Select the Amish Deluxe Secretary Desk with Doors and receive solid wood storage, a bookcase and a built-in desk to add to your American home furniture collection. The body of this solid wood secretary desk adds an interesting design element to any room you use it in. Create a cozy spot to handle bills and correspondence, then close the desk up and relax with a good book from the upper shelves. This versatile Amish desk features glass doors on the top that can easily feature china pieces if you wish! 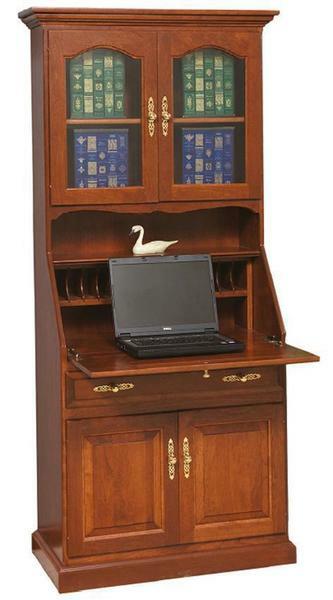 Browse the variety we offer in our collection of Amish Secretary Desks for a custom built cabinet and desk combo of your own.